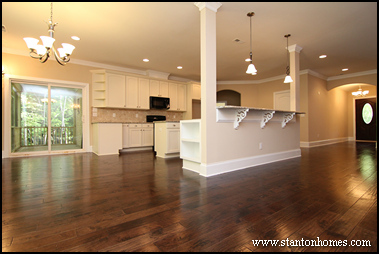 There are many home design techniques you can use to create an open concept floor plan - without having to increase your square footage or even necessarily re-arrange rooms. Interior clear glass, or French, doors can offer a level of privacy - and noise control - while also making your home feel larger and more open. French doors are a gorgeous addition to any room, and can be blended flawlessly into any space -- from the office to the master bathroom. 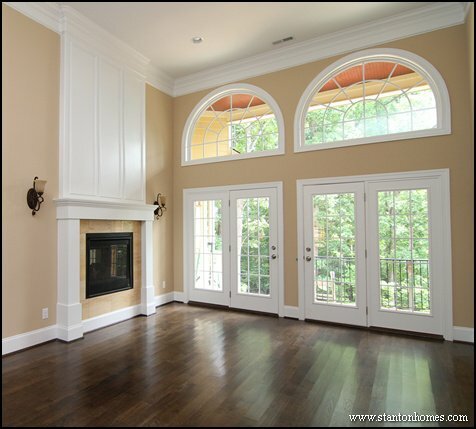 Interior French Doors come in three common configurations: a single French door that is 48 inches wide by 80 inches tall; a set of double French doors that are each 48 X 80 inches each; and a set of double French doors that are 24 X 80 inches each. 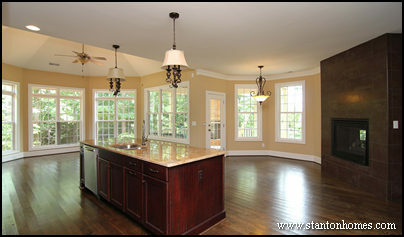 This home office photo features standard size double French doors. 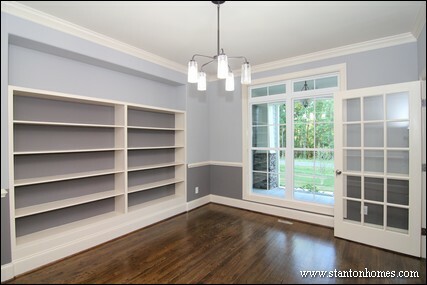 If a photo of a French door shows three rows of window panes, you can assume it is a standard size door. Custom homes can feature French doors in three distinct areas of the master bedroom: between the master bedroom and bathroom, the master bedroom and closet, and the master bedroom and outdoor living spaces. 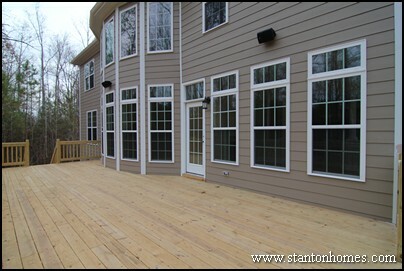 See an example of an exterior master suite French door below. To make a room feel even more open and bright, consider adding a transom window above the French door design - this will let more light in, and keep the room feeling softer. Exterior French doors come in a wide range of sizes, styles, and materials from composite wood to steel. This exterior French door was chosen to blend seamlessly into the rows of windows along the sun room and great room of this home. This French door is tucked around the corner from the breakfast room, just inside the great room wall. This keeping room - located just off the kitchen - incorporates many custom home must-haves, including a second fireplace, built in bookcases, and archways. This grand room would not be complete without the two sets of double doors, which draw tons of light through the two-sided fireplace. 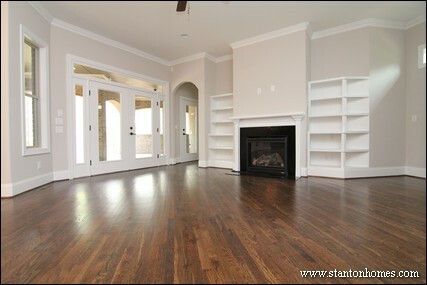 Here is an example of a master bedroom with French door access to outdoor living spaces. We're seeing an uptick in sun room home requests - such as the one pictured here, with two walls of windows and a single French door to the rear deck. An alternative to exterior French Doors, some home buyers choose glass sliding doors. Folding glass doors are becoming a more popular trend - and we expect to see more folding glass doors and full glass walls in 2015 custom homes. 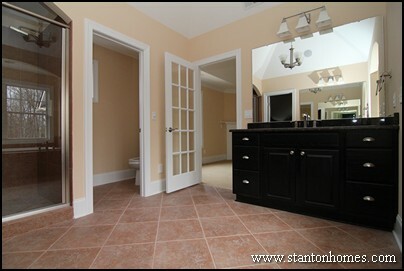 See over 70 more photos of French door style options - click here. There are three most popular French door window styles: grid, prairie grid, and no grid. 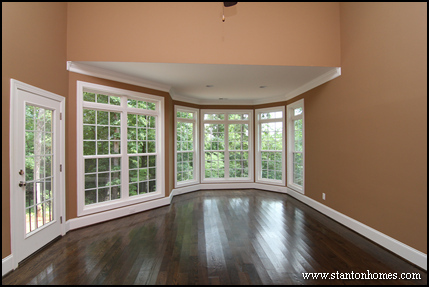 See examples of each window style, below. The most common style of French door is a white door with window grids. 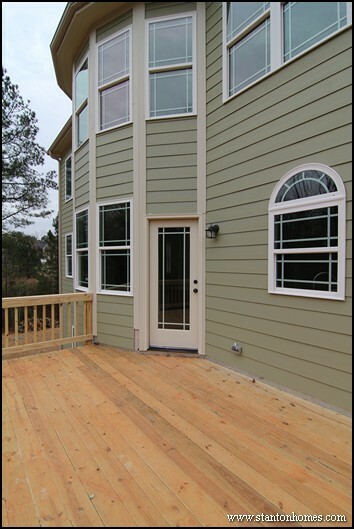 Prairie grid windows are another popular choice for Raleigh custom homes. Some home buyers simply love the look of the 9 unequal panels; others want windows that can help create a sense of a larger living space - with less obstructed light shining through. No grid French doors are most common in contemporary or modern style homes. As a side note - French doors are not necessarily a pair of doors, they are simply doors that consist mainly of glass. Enjoy more photos here! 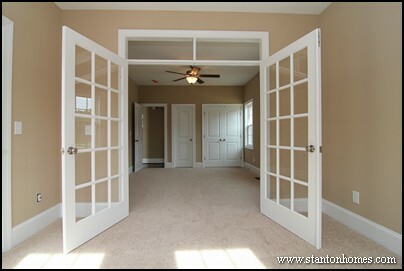 French Doors Design Ideabook - see over 70 more photos of French door style options - click here.